Bozeman's Fishing/Family Retreat Headquarters: The Lucky Dog Lodge is the perfect alternative to the full service guest lodge at roughly a tenth of the price. If you can handle cooking for yourself or eating out at the nearby selection of local fare, then come and enjoy all the privacy you want, along with all the space you need for the whole crew! 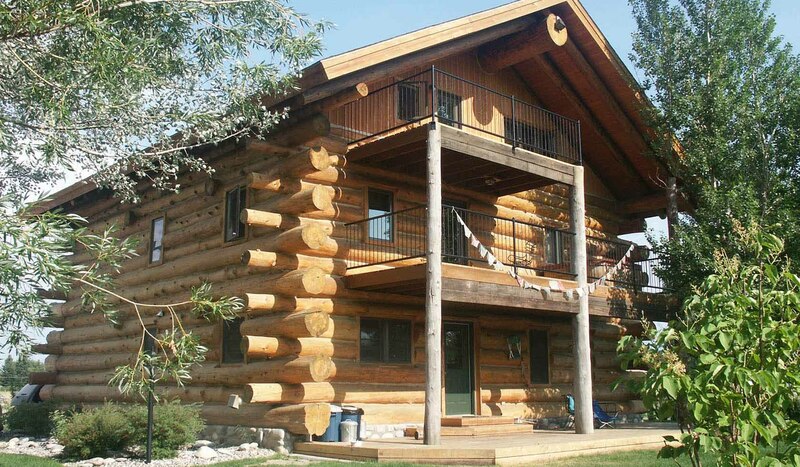 * Sleeps 15 comfortably in 6 bedrooms/5 bathrooms * Fish out the back door on the West Gallatin River (90 seconds away) * Fish the notorious Madison, Yellowstone or Missouri within 1 hour of the Lodge. * Yellowstone Park is just an hour and a half to the south. * Fishing guide service available - special rates for October/april * Amazing handmade log construction - finished in 2001 * Wireless internet, satellite tv/dvd/cd player * Hot tub on 2nd floor deck * 10 minutes from downtown Bozeman, midway between Big Sky & Bridger Bowl ski areas * Nicely landscaped yard for picnics & BBQs * Linens & towels provided, also washer/dryer with laundry soap Enjoy pure and simple comfort in this unique log structure built with gleaming ponderosa pine logs from Montana forests. Relax to the sounds of the legendary Gallatin River while resting in your log bed from an old Montana ranch. The Lucky Dog Lodge offers small and large gatherings a spacious modern vacation accommodation in a rural rustic setting. Conveniently located, Lucky Dog Lodge serves as the perfect home base for a terrific range of year-round activities for all ages, interests and abilities. You can walk out the back door with private access to the Gallatin River for an early morning fishing session, walk or bike a short distance downstream to Bozeman Hot Springs and Spa, or drive a few miles up Gallatin Canyon where hiking trails are numerous and everything from white water rafting to horseback riding is available. There's a public 18-hole golf course just minutes away. Downhill and cross country skiing, ice skating, and other winter activities are all conveniently located to the Lucky Dog Lodge including both Big Sky Resort and Bridger Bowl Ski Area. As you enter the Lucky Dog Lodge, your eye is immediately drawn to the third floor balcony and the massive logs and ridge pole surrounded by a ceiling of fir tongue-and-groove wood planks, lit up by a myriad of natural light. Open rooms and high ceilings provide a spacious and airy feel throughout. Radiant floor heating and thick logs maintain a comfortable temperature year-round. Wood decks extending from the second and third floors, as well a large ground level deck, offer views of a number of mountain ranges and the Gallatin River while you are entertaining or relaxing. Enjoy the sunset from the hot tub on the second story deck overlooking the Gallatin River and surrounding cottonwood forest. In all there are six bedrooms and five bathrooms - 3 queens in private bedrooms, 1 full size bed, 9 x-long twins (full and 2 twins in one room, 1 rooms with 2 twins, 3 twins in other bedroom) & 2 floor pads.